My wife has been asking for a seam ripper since I ventured into this new hobby a little over a year ago. So I thought I'd post the outcome. She and I are both happy with the way it came out. I know, I know... need to work my Photography. Wonderfully done! I like the blank and the subtle flow in design! Very nice start to a new project. 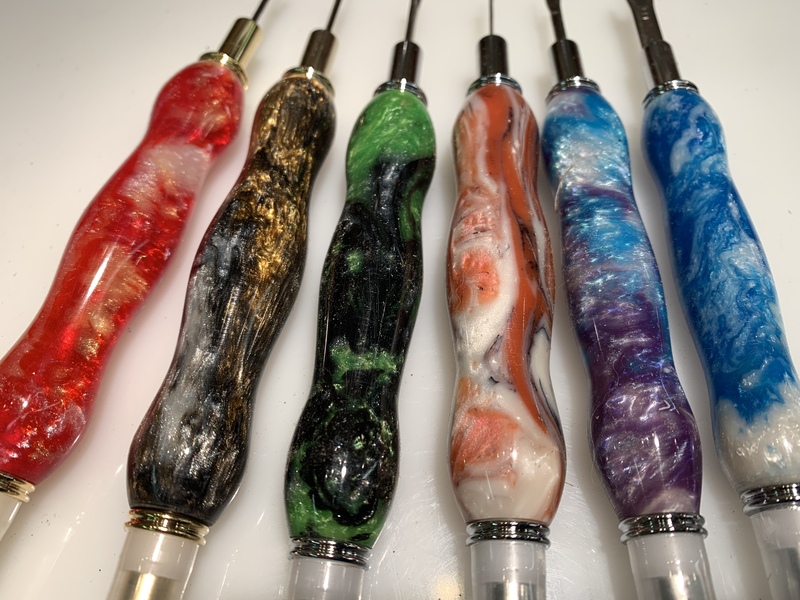 I make and sell double ended seam rippers with one small ripper and a stiletto. Long ago I started having a rounded portion near each end, similar to a classic dog bone shape. Numerous occupational therapists and quilters commented on how ergonomic the design was, who knew. I now am convinced this is the most comfortable shape for most women, especially women with some years behind them. Though it may seem counterintuitive for women where slim is in, larger ripper bodies and more comfortable for many. The photo is poor as I am under the weather for now. Last edited by mmayo; 02-10-2019 at 03:20 PM. Thanks for the advice. I will go for the more ergonomic shape on the next. Great job. I have made and sold a few of those lately. Feedback I received was that wood was preferred over acrylic (something about the textile feel) and the differentiation of small vs large sides visibly was requested, so I add lines now to mine, more lines on the large side. I’ve followed the theory of natural selection in settling on a profile, whatever sells the most gets reproduced more and a bit of minor random variation causes the profile to evolve. Apologies for the poor quality pic- the foreshortening obscures some of the shape, but the basic idea is still there. Concavity on both sides helps improve grip, and in general, older folk prefer the thicker ones, but not always-it’s good to have a range of thicknesses. The one on the far right is prolly too thin. I should add that these are all longer than the tubes supplied in the kit, the extra length being necessary to get a good grip from both sides. Last edited by Shock me; 02-11-2019 at 08:25 AM. 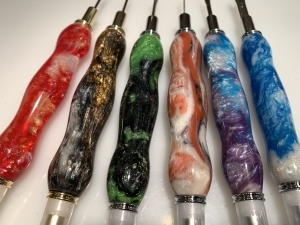 Seam rippers are a hot seller for me. I use only a specific species of wood and I use, like Mark said, a dog bone type style. And I make thinner ones and thicker ones for just about any style or size hand someone might have. I sent 12 to a store about 2 weeks ago and after 10 days they ordered 12 more. Wow! that is hot seller. If you don't mind me asking. How much do they typically sell for? Location: West Henrietta, NY, USA.